Ace shuttler PV Sindhu made the country proud in Rio Olympics Friday (19.08.2016) evening as she became the first Indian woman to win a Silver medal at the biggest sporting event of the world. 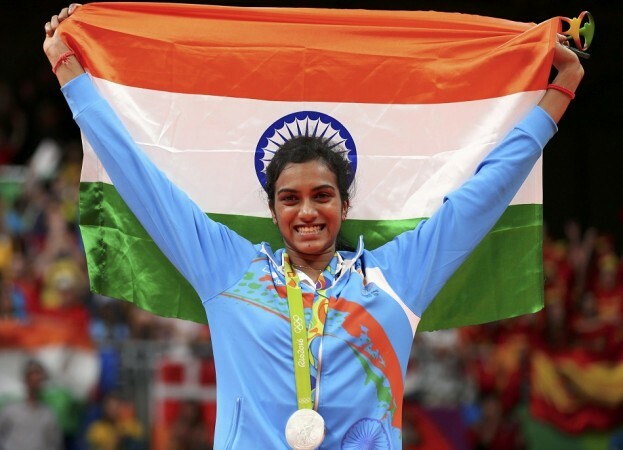 World number 10 Sindhu, playing in her first Olympic Games, went down fighting in the Gold medal match against world number one Carolina Marin of Spain, 21-19, 12-21, 15-21 to give India its first Olympic Silver medal in Badminton. The 21 year old Sindhu, youngest Indian to win a medal at Olympics, rose to podium to get that Silver medal and smiled as she made the country proud. The jouney for a medal in Badminton started from London 2012, when Saina Nehwal bagged the first medal a Bronze for India. Sindhu just went for a notch above and took Silver at Rio 2016. Now, all eyes should be on Tokyo 2020 as India searches for its Gold. President Pranab Mukherjee said, in a tweet, that it is a proud moment for India and the whole nation rejoices with Sindhu and her family. Prime Minister Narendra Modi said, Sindhu's accomplishment is historic and will be remembered for years.